Beaumont Hospital in Royal Oak has announced its new Pediatric Emergency Center will open Monday, July 16, and feature a patient- and family-centered environment designed to enhance its Level II pediatric trauma center. The 9,500-square-foot center features 16 private rooms that are twice as large as rooms in the former area. Three rooms will also include special features designed for the safety of behavioral health patients. Child life specialists will use play therapy and other techniques to ease anxiety. Artwork featuring animals from the Detroit Zoo, paintings from a local artist, and a self-serve pantry with free snacks and drinks will add to the environment. The center also includes a rooftop medical helipad. Board-certified pediatric emergency medicine specialists lead a team of staff members 24/7. The inpatient pediatric unit at Beaumont Children’s is an elevator ride away. 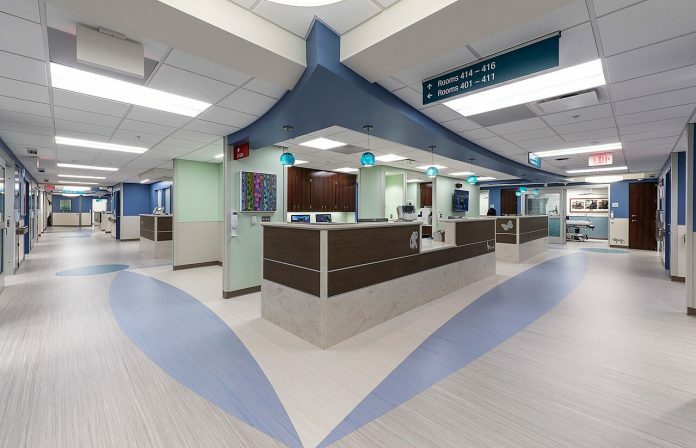 “The new center provides a quieter patient and family-centered environment with amenities that support the high-quality emergency care parents and families expect for children,” says Rosanna Morris, president of Beaumont Hospital, Royal Oak. The center is part of a 125,000-square-foot, $120.8 million expansion and renovation project that is expected to be completed in 2019. The emergency center is slated to have 73 private adult rooms, 20 semi-private rooms, 10 private behavioral health rooms, and 16 private pediatric rooms. During renovation, portions of the former center will remain in use, but 53 new private adult beds will be available for patients. The renovation also includes four expansive trauma care bays and an area offering quicker care for patients with minor injuries and illnesses. The renovation will also include rooms with glass doors and walls for quiet accommodations, phone charging stations, and a café. “We are expanding and renovating in phases, so we don’t disrupt care for our community. The new center brings diagnostic testing closer to or at the bedside to enhance patient comfort and convenience, as well as safety and efficiency of care,” says Terry Kowalenko, chair of emergency medicine at Beaumont Hospital, Royal Oak and professor and chairman, department of emergency medicine at Oakland University William Beaumont School of Medicine. MRI and CT imaging are located inside the center, and point-of-care testing is available at the bedside, including portable X-rays, echocardiograms, and Doppler ultrasounds to test for blood clots. Beaumont, Royal Oak’s emergency center is among the highest volume centers in the country, with 130,733 visits in 2017. Beaumont has eight hospitals with a combined 3,429 beds, 187 outpatient sites, nearly 5,000 physicians, 38,000 employees, and 3,500 volunteers.